Did you know that more snow has fallen atop Mauna Kea this year than in Chicago? Just recently, more than 8 inches of snow fell atop Hawaii’s tallest peak during an overnight blizzard, outpacing the amount that’s fallen in the Windy City! A road leads to the top: There are no lifts, no grooming, no resort, but a road goes to the summit to serve the dozen or so world class observatories located at the summit. Take turns: Basically, skiers take turns being the driver, who picks up the other skiers at the bottom of the runs and ferries them up to the summit. 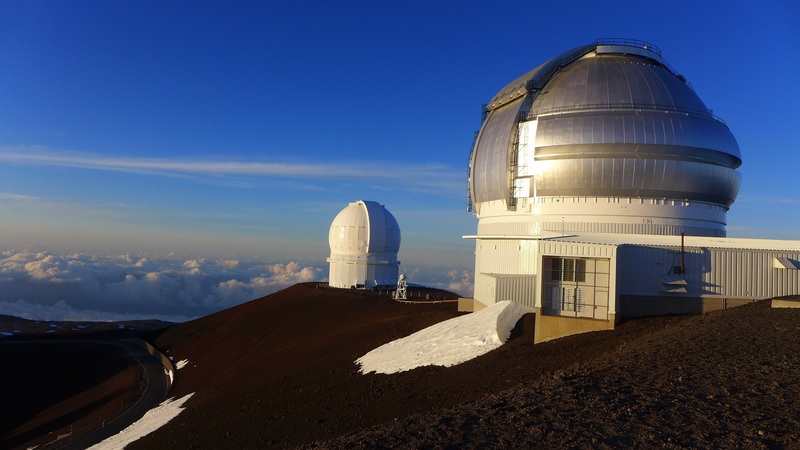 The summit of Mauna Kea is home to more than a dozen of the world's most famous observatories. Know the conditions: Conditions at the top are extremely variable. Winter temperatures range from 25 to 40 degrees F (-4 to 4 C), but wind chill and the high altitude can make it seem much colder. Between April and November the weather is milder, with daytime temperatures varying from 30 to 60 degrees F (0 to 15 C). The time to ski is after the islands get a big front passing through with lots of precipitation from high clouds, and Mauna Kea gets a good dump of snow. Breathe-Easy: You should be in very good physical shape, aerobically. The air is very thin, less than 60% of the air pressure at sea level, and most people experience altitude sickness to some degree. Know the snow: The snow can have some very strange texture after days of exposure to the intense sun. Some runs can be quite steep and the snow can end abruptly. There is no soft vegetation underneath, only hard lava rock and abrasive cinder. Go potty before you reach the summit: Remember, there is no food, water, gas, or bathroom available above the visitor station. Be disrespectful: Please realize that Mauna Kea is sacred to some Hawaiian people. Treat the area with respect. That means you should watch your language, stay away from marked sacred spots, and refrain from removing any rocks, plants, etc. Standing nearly 14-thousand feet tall, Mauna Kea is regularly snow-capped during the winter months. Get in an astronomer’s way: Also please remember that Mauna Kea is one of the best sites in the world for astronomy. Avoid interferring with astronomers’ work. Get stuck: Although this one may be unavoidable in many cases, skiers’ cars stuck on the road can also cause significant problems for those working at the summit. The observatory staff also have had to spend some of their very valuable time at the summit rescuing skiers or snowboarders who weren’t able to stop before the snow did. If you want to experience the beauty of this year’s Mauna Kea snow, but don’t want to ski or snowboard, remember you can always book a Big Island Helicopter Tour through Hawaii Aloha Travel. If you book the The Hawaii Experience Tour, you can choose to have your pilot fly you above Mauna Loa and Mauna Kea, the mountain slopes of Hualalai, Kealakekua Bay and Captain Cook Bay, South Kona, and of course, the famed Kilauea volcano. If you’re an avid skier or snowboarder, this year’s snowfall is perfect for a Mauna Kea ski or snowboard adventure. Just remember our tips and safety checklist before you go!